There have been countless books, articles and barroom debates aimed at determining the greatest teams and greatest players in NBA history, assembling the greatest starting five or twelve-man NBA roster in history. I’ve had lots of fun debating these topics in the past and cannot promise that such an article, authored by me, will not make its way onto this site. However, the problem with these simple debates is that they neglect an entire universe of star players who fall short of the top fifteen or twenty in the game’s history. To address this, I’ve put together an all-time starting five for each NBA franchise (I’ve omitted the Charlotte Bobcats), consisting of players who suited up in at least 200 games (a bit of wiggle room was used here) for a franchise. I tried to adhere to a strict C, PF, SF, SG, PG line-up, not just 2 guards, 2 forwards and a center – though this rule was bent on occasion. I didn’t invent a convoluted, John Hollinger-esque formula to determine these line-ups – this is based on statistical productivity with some consideration given to the era in which a guy played, and contribution to team success, with presence during high points in franchise history and “face of a franchise” status playing a big role. Many results are as expected, but some forced me to stare at the numbers and admit that my initial perception had changed. Rather than go nuts and give you 29 starting fives to consider in one sitting, I will post these one at a time, over the next month. We’ll start with teams of the Atlantic Division. Have fun reading and debating. Whether you agree or think I’m an idiot, don’t hesitate to let me know. I’m eager to hear your opinions. Leading off this series is the Boston Celtics. As a lifelong Lakers fan that grew up in L.A. in the 1980s, there are a handful of guys here that are very easy for me to hate, but with their talent and toughness, there’s no way to avoid respecting them. A no-brainer, really. While Dennis Johnson (12.6 ppg, 6.4 apg in 541 games) hit some big shots and played some fantastic, hard-nosed D for the C’s in the 80s, an at-the-end Tiny Archibald (12.5 ppg, 7.1 apg in 363 games) and the rapidly developing Rajon Rondo have manned the point for title-winning Celtics teams, none of the three is even close to the quarterback of the pre- and early-Russell Celtics’ dynasty. Cousy’s resume speaks for itself. 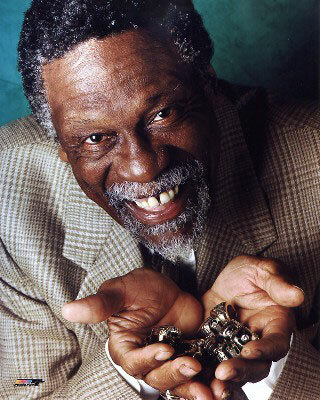 He was an All-Star in all but one of his 14 seasons with the Celtics, First-Team All-NBA 10 times, collected a half-dozen championship rings and the 1957 MVP, but his spectacular – and, at the time, revolutionary – ballhandling and way he led the break made him a legend. 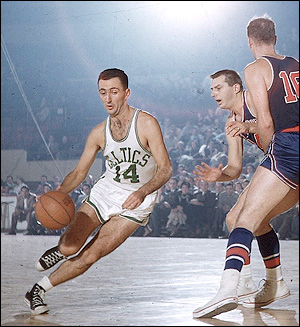 Also, more important than anything he ever did on the floor, Cousy stood at the back of teammate Bill Russell in the face of segregation and blatant racism at a time when it was neither easy nor popular to do so. Despite some worthy competition from Bill Sharman, Jojo White and Ray Allen, all title-winners, Jones was Bill Russell’s running mate for almost all of Russell’s career – accumulating a staggering ten championship rings in the process – and is regarded as perhaps the greatest big-game player of his era. Anyone who’s read page 442 of Bill Simmons’ “Book of Basketball” will recall the laundry list of Jones’ big-game performances (too long to list here), which included topping Oscar Robertson in 1963 Game 7 (47-43) and a 37-pointer in the famous “Havlicek steals the ball” game. If Russell is regarded as the ultimate champion, Jones cannot be far behind. As impressive as the statistics and achievements may be, his role as crunch-time scorer throughout the Russell years is the true foundation of Sam Jones’ legend. The greatest Celtic since Russell, and the personification of Celtic greatness for all fans under the age of 50. 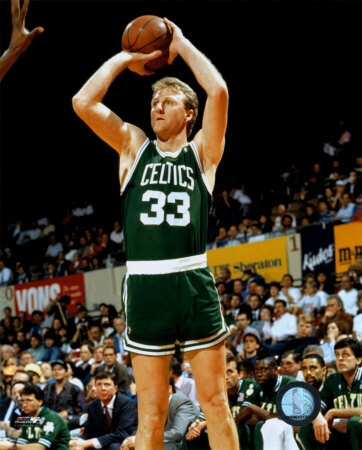 Bird is not only one of the NBA-s all-time greats in terms of intangibles (think of terms like “assassin” and “clutch”), three championship rings (1981, 1984, 1986), three consecutive MVP awards (1984-1986) and a dozen trips to the All-Star game make him the standard by which all post-merger Celtics – and maybe small forwards in general – are judged. It should be noted that this is a particularly strong position, featuring not only Bird, but Paul Pierce and Celtic legend John Havlicek as well. While Pierce (22.5 ppg, 6.1 rpg, 3.8 apg in 884 games) and Havlicek (20.8 ppg, 6.3 rpg, 4.8 apg in 1,270 games) both hold their own statistically, and Hondo’s 8 rings must be considered, Bird was the unquestioned leader of the 1980s Celtics and is THE starting SF for the Celtics. A pretty easy call considering McHale’s almost 1,000 games played, three rings and seven All-Start selections, as well as somewhat limited competition for this spot (sorry KG!). 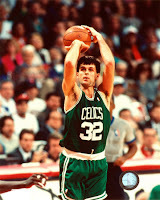 While he wasn’t a statistical wonder – although his 26-10 on 60% FG in 1986-87 was pretty awesome – McHale’s greatness was defined by the greatest arsenal of low-post moves of his, and perhaps any, era. Just listening to interviews with anyone that that had to guard McHale in his prime, you realize that this guy was virtually unstoppable anywhere near the paint. Toss his incredible toughness (he played the 1987 postseason with a broken foot!) and it’s hard to argue against McHale. A additional Celtics PF note: there’s no doubt that Kevin Garnett has played some excellent ball in his time in Boston and was the defensive and inspirational leader of the 2008 title team, but did you know his numbers in 197 games with the C’s (16.4 ppg, 8.4 rpg, 1.3 bpg) actually fall short of those of the immortal Dino Radja (16.7- 8.4- 1.3)?! The ultimate champion. The incredibly reverential tone that former teammates and opponents use when talking about Russell removes any doubt that he was the king of intangibles. And while 11 championships in 13 years is his ultimate statistic, Russell’s other career stats also stack up well against those of most centers in NBA history – and that’s with no stats on blocks or steals! There’s little more to say about Russell – competitor, winner, champion, defensive revolutionary. 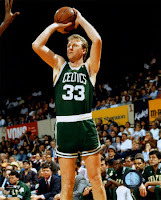 In addition to Russell, the Celtics have featured a pair of noteworthy big men – Dave Cowens and Robert Parish – with multiple championships on the resume, either of whom would qualify as the best big man in the history of most franchises. 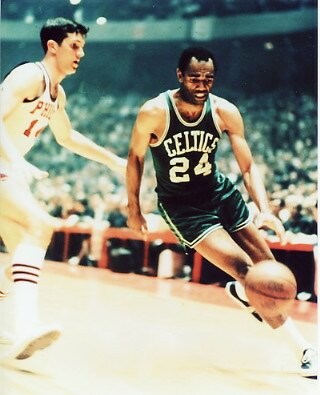 Not only does Cowens have the statistical edge (18.2 ppg, 14 rpg, 3.9 apg), but he and the aging John Havlicek kept the Celtics afloat in the 1970s and served as the bridge between the Russell and Bird eras. Meanwhile, the Chief put up some numbers himself (16.5- 10- 1.5 bpg in 1,106 games), and was a huge part of the Celtics Big Three of 1980s, winning three titles.